Media captionUS Lt Gen Stephen Townsend: IS militants "are very adaptable, creative, cunning"
The so-called Islamic State (IS) group is "a brutal opponent" in the fight for Mosul, the head of coalition forces for Iraq and Syria has told the BBC. US Lt Gen Stephen Townsend was speaking on the sidelines of the battle to retake the Iraqi city from the jihadist group. Gen Townsend also said IS was "adaptable, creative and cunning". Iraqi forces on Thursday said they had re-captured the town of Bartella, less than 15km (10 miles) east of Mosul. The predominantly Christian town had seen fierce IS resistance, with reports of several suicide car bombs by militants in response to the special forces' advance. Bartella is key to the major offensive to retake Mosul, according to the head of Iraq's counter-terrorism service, Taleb Sheghati al-Kenani. Elsewhere, Islamic State fighters were reported to have set fire to a chemical plant south of Mosul, as they were retreating. It is not yet clear if the fire has been extinguished - a similar fire at the same plant in 2003 burnt for weeks, sending sulphur dioxide into the air. Separately on Thursday, the US said an American soldier had been killed in a roadside bomb attack in northern Iraq. The incident was the fourth US combat fatality in Iraq since operations against IS began there and in Syria in 2014. 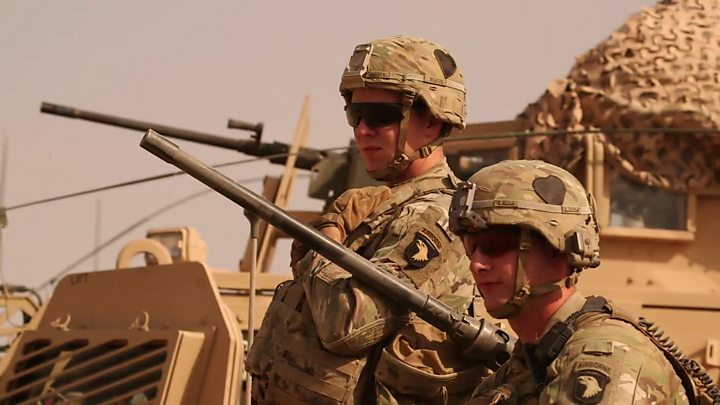 "They're using human shields in there," Gen Townsend said in an exclusive interview with the BBC on Thursday, speaking from an artillery position where US troops were providing fire support to Iraqi forces. "This is a brutal opponent that has to be stopped," said Gen Townsend, who heads foreign forces in the fight against IS. "They saw people's heads off on TV, they drown people and video it, they burn people alive in cages, they crucify people and they drive over people on the street with bulldozers." Mosul has been in the hands of IS since 2014 and is the militants' last major Iraqi stronghold. As many as 1.5 million civilians are thought to still be inside the city, with reports from inside suggesting basic supplies are running out. The International Organization for Migration says fighting around the city has already forced 5,640 people to flee, according to Reuters news agency. Meanwhile, Iraqi Prime Minister Haider al-Abadi told an international meeting in Paris on Thursday that the four-day offensive was "advancing faster than planned". He also hailed co-operation between the army and Kurdish troops, saying they were "fighting harmoniously together" to free Iraqi territory from IS. The Iraqi army is moving from the south, as Kurdish fighters launch a large-scale operation east and north of the city. Kurdish forces opened up a new front in the town of Bashiqa, which lies some 25km (16 miles) north east of Mosul. Thick smoke was seen rising from the town, which a day earlier was pounded by air strikes and mortar fire. Officials have warned that the push to take Mosul could take weeks or months, with IS fighters appearing to be putting up stiff resistance in some areas. There are unconfirmed reports of IS leaders fleeing the city, but up to 5,000 fighters are still thought to be in the city. The whereabouts of IS leader Abu Bakr al-Baghdadi are unknown.